Book your JR Pass and get a free basic travel guide! Japan Rail Pass is a multi-use discounted ticket, valid for travels on all JR national trains in Japan, including Shinkansen bullet trains and Narita Express. You can select 7, 14 or 21 consecutive validity days. Choose between Standard and Green Pass (first class). Order your JR Pass online. You will receive an Exchange Order (delivery in Japan available), which then needs to be exchanged and activated in Japan for the actual JR Pass. All foreign nationals who visit Japan for tourist reasons can purchase it. Book now and take part in our #Instagram contest. You can get your #jrailpass money back! JR Pass is designed for foreign visitors who travel to Japan for tourist purposes (less than 90 days). Can I buy the Japan Rail Pass in Japan? The Japan Rail Pass be will sold at a higher price and on a trial basis in Japan from March 8, 2019 through March 31, 2020 at major stations and airports. Stations in Japan where the Japan Rail Pass will be sold: Sapporo, Sendai, Niigata, Tokyo, Shinjuku, Yokohama, Nagoya, Osaka, Hiroshima, Takamatsu, Hakata. Airports in Japan, where the Japan Rail Pass will be sold: Narita Airport, Terminals 1-2-3; Haneda Airport - International Airport; Kansai Airport. Is there a children discount? Yes, there is a children's discount of 50% the price of a standard/Green pass. Children between the ages of 6 through 11 are eligible for the discount. Can I have my order sent to Japan? Yes, all orders (JR Pass, Pocket Wi-Fi, Data SIM) can be sent to your temporary address in Japan. Users can select whether they wish to have their order sent to their home or temporary address during the check-out process. Does the Japan Rail Pass cover Narita Express (N'EX) ? Yes, the Narita Express (N'EX) is covered by the Japan Rail Pass, which means all JR holders can ride the train for free. This is a great advantage, considering that a return Narita ticket would cost you between 3,000¥ and 5,000¥, depending on your destination. Once at the airport, check for the nearest JR train ticket counter and exchange your order for the actual Japan Rail Pass. Once you have the pass, make sure to book your seats on the Narita Express, as this train is reservation only. 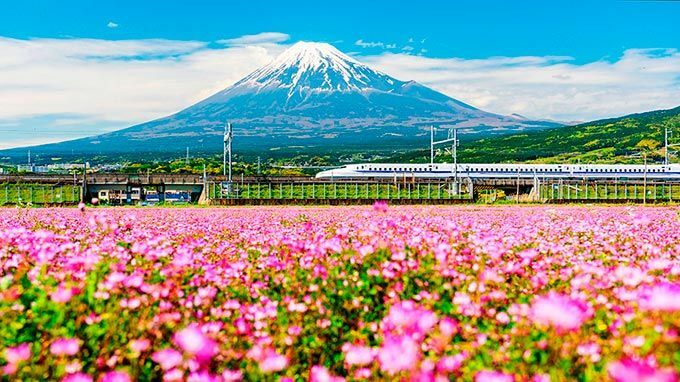 With the Japan Rail Pass and the booked seats you will be ready to go. Narita offers spacious seating spaces, perfect for long-distance arrivals. Read more about the Narita Express in our blog. When do my tickets arrive? Upon completing each purchase, users will receive a confirmation email with a direct link to live shipment tracking. The standard delivery time is two (2) business days. Do the 7 / 14 / 21 days need to be consecutive? Yes, the selected number of days need to be consecutive. Note that once activated, the validity period of each pass cannot be changed nor prolonged. Can I book a seat on the JR Trains? Yes, all JR Pass holders can book a seat on any of the JR trains. However, they must do so in advance, before boarding the train. What are the payment methods available on this web? You may complete your purchase on this website via one of the following payment methods: American Express, Visa, Master Card, PayPal, Bank Transfer. Please, always verify the Credit Card / PayPal / Bank transfer details, before completing your purchase. You will receive an order confirmation only after the online order has been completed successfully. Can I stay connected while in Japan? Fast internet connection and limitless Wi-Fi for up to 10 devices. Stay in touch anywhere you go. High-speed internet straight from your phone (225Mb/s). Micro and nano sim cards available. Share memories instantly. Discover Japan and plan your trip with us: travel guides, transportation tips, useful resources, itineraries and much more!